The atmosphere of the distant “warm Neptune” HAT-P-26b, illustrated here, is unexpectedly primitive, composed primarily of hydrogen and helium. By combining observations from NASA’s Hubble and Spitzer space telescopes, researchers determined that, unlike Neptune and Uranus, the exoplanet has relatively low metallicity, an indication of the how rich the planet is in all elements heavier than hydrogen and helium. A study [Science]combining observations from NASA’s Hubble and Spitzer space telescopes reveals that the distant planet HAT-P-26b has a primitive atmosphere composed almost entirely of hydrogen and helium. Astronomers have produced a highly detailed image of the Crab Nebula, by combining data from telescopes spanning nearly the entire breadth of the electromagnetic spectrum, from radio waves seen by the Karl G. Jansky Very Large Array (VLA) to the powerful X-ray glow as seen by the orbiting Chandra X-ray Observatory. This composite image of the Crab Nebula, a supernova remnant, was assembled by combining data from five telescopes spanning nearly the entire breadth of the electromagnetic spectrum: the Very Large Array, the Spitzer Space Telescope, the Hubble Space Telescope, the XMM-Newton Observatory, and the Chandra X-ray Observatory. The new VLA, Hubble and Chandra observations all were made at nearly the same time in November of 2012. A team of scientists led by Gloria Dubner of the Institute of Astronomy and Physics (IAFE), the National Council of Scientific Research (CONICET) and the University of Buenos Aires in Argentina then made a thorough analysis of the newly revealed details in a quest to gain new insights into the complex physics of the object. They are reporting their findings in the Astrophysical Journal. “Comparing these new images, made at different wavelengths, is providing us with a wealth of new detail about the Crab Nebula. Though the Crab has been studied extensively for years, we still have much to learn about it,” Dubner said. When you look out into the distant Universe, in most locations, you’ll find a field of faint, distant galaxies: beautiful, but nothing special. Six billion light years away, Abell 370 is one of the most massive, dense ones discovered so far, but one galaxy, noticed early on, provided a hint of something more. The “stretched-out” galaxy you see here isn’t a distorted cluster member, but is instead two images of a single galaxy, twice as far away as the cluster itself. This phenomenon of gravitational lensing stretches galaxies into streaks and arcs, magnifying them, and creating multiple images. It also enables us to reconstruct the mass distribution of the cluster, revealing that it’s mostly due to dark matter. There are two separate clumps present, showing that this is likely two clusters merging together. Most importantly, dark matter must be present — and present outside of the individual galaxies themselves — to explain these gravitational effects. Additional observations from 2009-2017 reveal unprecedented details about the massive, distant Universe. Much like the eclectic group of space rebels in the upcoming film Guardians of the Galaxy Vol. 2, NASA’s Hubble Space Telescope has some amazing superpowers, specifically when it comes to observing innumerable galaxies flung across time and space. A stunning example is a galaxy cluster called Abell 370 that contains an astounding assortment of several hundred galaxies tied together by the mutual pull of gravity. That’s a lot of galaxies to be guarding, and just in this one cluster! Photographed in a combination of visible and near-infrared light, the immense cluster is a rich mix of a variety of galaxy shapes. The brightest and largest galaxies in the cluster are the yellow-white, massive, elliptical galaxies containing many hundreds of billions of stars each. Spiral galaxies — like our Milky Way — have younger populations of stars and are bluish. Entangled among the galaxies are mysterious-looking arcs of blue light. These are actually distorted images of remote galaxies behind the cluster. These far-flung galaxies are too faint for Hubble to see directly. Instead, the cluster acts as a huge lens in space that magnifies and stretches images of background galaxies like a funhouse mirror. The massive gravitational field of the foreground cluster produces this phenomenon. The collective gravity of all the stars and other matter trapped inside the cluster warps space and affects light traveling through the cluster, toward Earth. Nearly a hundred distant galaxies have multiple images caused by the lensing effect. The most stunning example is “the Dragon,” an extended feature that is probably several duplicated images of a single background spiral galaxy stretched along an arc. Astronomers chose Abell 370 as a target for Hubble because its gravitational lensing effects can be used for probing remote galaxies that inhabited the early universe. Abell 370 is located approximately 4 billion light-years away in the constellation Cetus, the Sea Monster. It is the last of six galaxy clusters imaged in the recently concluded Frontier Fields project. This ambitious, community-developed collaboration among NASA’s Great Observatories and other telescopes harnessed the power of massive galaxy clusters and probed the earliest stages of galaxy development. The program reveals galaxies that are 10 to 100 times fainter than any previously observed. Recent observations of Jupiter’s icy moon Europa by NASA’s Hubble Space Telescope have uncovered a probable plume of material erupting from the moon’s surface at precisely the same location as a similar apparent plume seen two years earlier by Hubble. These images bolster evidence that the plumes are a real phenomenon, flaring up intermittently in the same region on the satellite. In the most recent observation — Feb. 22, 2016 — Hubble’s Space Telescope Imaging Spectrograph (STIS) uncovered a dark patch, silhouetted against Jupiter and protruding slightly off the surface at Europa’s equatorial region. The dark feature is not only in the same location but is also similar in appearance to the one seen in a previous STIS study of Europa, taken March 17, 2014. For both the 2016 and 2014 observations, Sparks and his team used the same transit technique to uncover the plumes in ultraviolet light. As Europa passes in front of Jupiter, any atmospheric features around the edge of the moon block some of Jupiter’s light, allowing STIS to see those features in silhouette. The plumes correspond to the location of an unusually warm spot on the moon’s icy crust, seen in the late 1990s by NASA’s Galileo spacecraft. Researchers speculate that this might be circumstantial evidence for water erupting from the moon’s subsurface. Such a “location of interest” may be a site where material dredged up from beneath Europa’s surface could be analyzed for habitability by a future visiting spacecraft. “If there is a causal link between the plumes and the thermal anomaly, there could be geologic activity on Europa’s surface that is producing the plumes, or the plume activity may be influencing the surface thermal properties,” said lead researcher William Sparks of the Space Telescope Science Institute (STScI) in Baltimore, Maryland. The newly imaged plume rises about 62 miles above Europa’s surface. The plume observed by Hubble in 2014 in the same location was estimated to be about 30 miles high. Sparks’ team matched the plumes’ position with their corresponding location on the thermal map taken of the moon’s night side by Galileo. The absence of sunlight at night allows Europa’s surface to cool down. But the researchers spotted a region that was warmer than the surrounding area. This region, roughly 200 miles across, is in the same location as the observed plumes. The area was previously identified as a “thermal anomaly,” because it was a few degrees warmer than the surrounding terrain. Such an apparently minor temperature variation is significant, considering that Europa’s icy surface is so cold. One possibility for the temperature variation is that an infusion of energy warmed up the frigid surface. Another idea is that the surface retains an abnormal amount of heat. Both possibilities suggest that unusual activity is taking place. The plumes and the warm spot could be generated by a variety of geological activity. The team has proposed two possible scenarios for a link between the two features. The warmer area could be caused by the heat from liquid water, located more than one mile beneath Europa’s thick, icy crust. The water is pushed upward and cracks the surface, venting as a plume. Another idea is that water ejected by the plume falls onto the surface as a fine mist. This process could change the structure of the surface grains, allowing them to retain heat longer than the surrounding landscape. Sparks and his team are continuing to use Hubble to search for additional examples of plume candidates on Europa, hoping to determine the frequency with which they appear. The results will appear on April 13, 2017, in The Astrophysical Journal Letters. The Hubble Space Telescope is a project of international cooperation between NASA and the European Space Agency. NASA’s Goddard Space Flight Center in Greenbelt, Maryland, manages the telescope. The Space Telescope Science Institute in Baltimore, Maryland, conducts Hubble science operations. STScI is operated for NASA by the Association of Universities for Research in Astronomy in Washington, D.C.
An international team of astronomers using the NASA/ESA Hubble Space Telescope have uncovered a supermassive black hole that has been propelled out of the centre of the distant galaxy 3C186. The black hole was most likely ejected by the power of gravitational waves. This is the first time that astronomers found a supermassive black hole at such a large distance from its host galaxy centre. Though several other suspected runaway black holes have been seen elsewhere, none has so far been confirmed. Now astronomers using the NASA/ESA Hubble Space Telescope have detected a supermassive black hole, with a mass of one billion times the Sun’s, being kicked out of its parent galaxy. “We estimate that it took the equivalent energy of 100 million supernovae exploding simultaneously to jettison the black hole,” describes Stefano Bianchi, co-author of the study, from the Roma Tre University, Italy. The images taken by Hubble provided the first clue that the galaxy, named 3C186, was unusual. 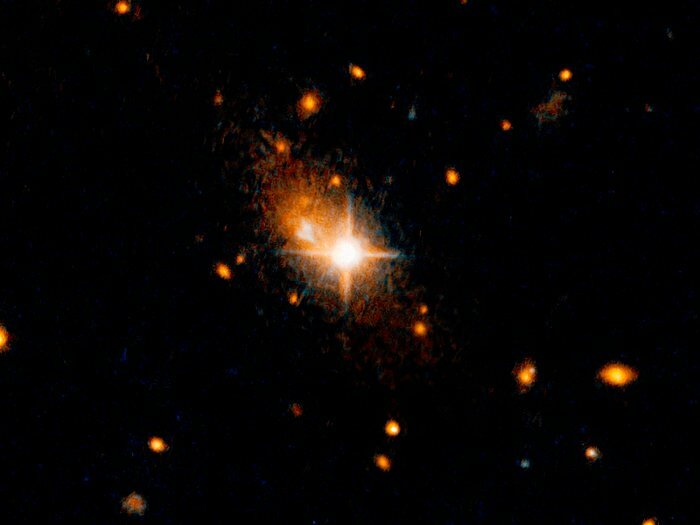 The images of the galaxy, located 8 billion light-years away, revealed a bright quasar, the energetic signature of an active black hole, located far from the galactic core. “Black holes reside in the centres of galaxies, so it’s unusual to see a quasar not in the centre,” recalls team leader Marco Chiaberge, ESA-AURA researcher at the Space Telescope Science Institute, USA. The team calculated that the black hole has already travelled about 35 000 light-years from the centre, which is more than the distance between the Sun and the centre of the Milky Way. And it continues its flight at a speed of 7.5 million kilometres per hour . At this speed the black hole could travel from Earth to the Moon in three minutes. Although other scenarios to explain the observations cannot be excluded, the most plausible source of the propulsive energy is that this supermassive black hole was given a kick by gravitational waves  unleashed by the merger of two massive black holes at the centre of its host galaxy. This theory is supported by arc-shaped tidal tails identified by the scientists, produced by a gravitational tug between two colliding galaxies. According to the theory presented by the scientists, 1-2 billion years ago two galaxies — each with central, massive black holes — merged. The black holes whirled around each other at the centre of the newly-formed elliptical galaxy, creating gravitational waves that were flung out like water from a lawn sprinkler . As the two black holes did not have the same mass and rotation rate, they emitted gravitational waves more strongly along one direction. When the two black holes finally merged, the anisotropic emission of gravitational waves generated a kick that shot the resulting black hole out of the galactic centre. The researchers are lucky to have caught this unique event because not every black hole merger produces imbalanced gravitational waves that propel a black hole out of the galaxy. The team now wants to secure further observation time with Hubble, in combination with the Atacama Large Millimeter/submillimeter Array (ALMA) and other facilities, to more accurately measure the speed of the black hole and its surrounding gas disc, which may yield further insights into the nature of this rare object. As the black hole cannot be observed directly, the mass and the speed of the supermassive black holes were determined via spectroscopic analysis of its surrounding gas. First predicted by Albert Einstein, gravitational waves are ripples in space that are created by accelerating massive objects. The ripples are similar to the concentric circles produced when a rock is thrown into a pond. In 2016, the Laser Interferometer Gravitational-wave Observatory (LIGO) helped astronomers prove that gravitational waves exist by detecting them emanating from the union of two stellar-mass black holes, which are several times more massive than the Sun. The black holes get closer over time as they radiate away gravitational energy. The puzzling case of the radio-loud QSO 3C 186: a gravitational wave recoiling black hole in a young radio source? Normally, hefty black holes anchor the centers of galaxies. So researchers were surprised to discover a supermassive black hole speeding through the galactic suburbs. Black holes cannot be observed directly, but they are the energy source at the heart of quasars — intense, compact gushers of radiation that can outshine an entire galaxy. NASA’s Hubble Space Telescope made the discovery by finding a bright quasar located far from the center of the host galaxy. Researchers estimate that it took the equivalent energy of 100 million supernovas exploding simultaneously to jettison the black hole. What could pry this giant monster from its central home? The most plausible explanation for this propulsive energy is that the monster object was given a kick by gravitational waves unleashed by the merger of two black holes as a result of a collision between two galaxies. First predicted by Albert Einstein, gravitational waves are ripples in the fabric of space that are created when two massive objects collide. Astronomers have uncovered a supermassive black hole that has been propelled out of the center of a distant galaxy by what could be the awesome power of gravitational waves. Though there have been several other suspected, similarly booted black holes elsewhere, none has been confirmed so far. Astronomers think this object, detected by NASA’s Hubble Space Telescope, is a very strong case. Weighing more than 1 billion suns, the rogue black hole is the most massive black hole ever detected to have been kicked out of its central home. Researchers estimate that it took the equivalent energy of 100 million supernovas exploding simultaneously to jettison the black hole. The most plausible explanation for this propulsive energy is that the monster object was given a kick by gravitational waves unleashed by the merger of two hefty black holes at the center of the host galaxy. First predicted by Albert Einstein, gravitational waves are ripples in space that are created when two massive objects collide. The ripples are similar to the concentric circles produced when a hefty rock is thrown into a pond. Last year, the Laser Interferometer Gravitational-Wave Observatory (LIGO) helped astronomers prove that gravitational waves exist by detecting them emanating from the union of two stellar-mass black holes, which are several times more massive than the sun. Chiaberge’s paper will appear in the March 30 issue of Astronomy & Astrophysics. Hubble images taken in visible and near-infrared light provided the first clue that the galaxy was unusual. The images revealed a bright quasar, the energetic signature of a black hole, residing far from the galactic core. Black holes cannot be observed directly, but they are the energy source at the heart of quasars – intense, compact gushers of radiation that can outshine an entire galaxy. The quasar, named 3C 186, and its host galaxy reside 8 billion light-years away in a galaxy cluster. The team discovered the galaxy’s peculiar features while conducting a Hubble survey of distant galaxies unleashing powerful blasts of radiation in the throes of galaxy mergers. The team calculated the black hole’s distance from the core by comparing the distribution of starlight in the host galaxy with that of a normal elliptical galaxy from a computer model. The black hole had traveled more than 35,000 light-years from the center, which is more than the distance between the sun and the center of the Milky Way. Based on spectroscopic observations taken by Hubble and the Sloan survey, the researchers estimated the black hole’s mass and measured the speed of gas trapped near the behemoth object. Spectroscopy divides light into its component colors, which can be used to measure velocities in space. “To our surprise, we discovered that the gas around the black hole was flying away from the galaxy’s center at 4.7 million miles an hour,” said team member Justin Ely of STScI. This measurement is also a gauge of the black hole’s velocity, because the gas is gravitationally locked to the monster object. The astronomers calculated that the black hole is moving so fast it would travel from Earth to the moon in three minutes. That’s fast enough for the black hole to escape the galaxy in 20 million years and roam through the universe forever. The Hubble image revealed an interesting clue that helped explain the black hole’s wayward location. The host galaxy has faint arc-shaped features called tidal tails, produced by a gravitational tug between two colliding galaxies. This evidence suggests a possible union between the 3C 186 system and another galaxy, each with central, massive black holes that may have eventually merged. Based on this visible evidence, along with theoretical work, the researchers developed a scenario to describe how the behemoth black hole could be expelled from its central home. According to their theory, two galaxies merge, and their black holes settle into the center of the newly formed elliptical galaxy. As the black holes whirl around each other, gravity waves are flung out like water from a lawn sprinkler. The hefty objects move closer to each other over time as they radiate away gravitational energy. If the two black holes do not have the same mass and rotation rate, they emit gravitational waves more strongly along one direction. When the two black holes collide, they stop producing gravitational waves. The newly merged black hole then recoils in the opposite direction of the strongest gravitational waves and shoots off like a rocket. An alternative explanation for the offset quasar, although unlikely, proposes that the bright object does not reside within the galaxy. Instead, the quasar is located behind the galaxy, but the Hubble image gives the illusion that it is at the same distance as the galaxy. If this were the case, the researchers should have detected a galaxy in the background hosting the quasar. If the researchers’ interpretation is correct, the observations may provide strong evidence that supermassive black holes can actually merge. Astronomers have evidence of black-hole collisions for stellar-mass black holes, but the process regulating supermassive black holes is more complex and not completely understood. The team hopes to use Hubble again, in combination with the Atacama Large Millimeter/submillimeter Array (ALMA) and other facilities, to more accurately measure the speed of the black hole and its gas disk, which may yield more insight into the nature of this bizarre object. See the full NASA HubbleSite story here . Happy 20th birthday to Hubble’s Space Telescope Imaging Spectrograph (STIS)! In February 1997, astronauts installed STIS on the telescope during the second servicing mission. The highly versatile and productive instrument combines a camera with a spectrograph, which separates light into its component colors—or wavelengths — to provide a “fingerprint” of the object being observed. This tells us about the object’s temperature, chemical composition, density, and motion. Spectrographic observations also reveal changes in celestial objects as the universe evolves. STIS has also pioneered the field of high-contrast imaging—the art of capturing faint objects (such as planets, disks, and outflowing jets) next to very bright ones (such as the stars they accompany). The instrument is sensitive to a wide range of wavelengths of light, from ultraviolet through the optical and into the near-infrared. STIS science has illuminated a multitude of different astronomical topics. Below are some examples, but this is not meant to be an exhaustive list. Astronomers used STIS to conduct a census of more than 30 galaxies to look for evidence of massive black holes at their centers. STIS precisely measures the speed of gas and stars around a black hole, and this yields information about its mass. The findings presented a broad picture of a galaxy’s evolution and its relationship to the growth of the massive central black hole. Hubble evidence favors the idea that titanic black holes did not precede a galaxy’s birth, but instead co-evolved with the galaxy by trapping a surprisingly exact proportion of the mass of the central hub of stars and gas in that galaxy. Astronomers have long sought the vast quantities of hydrogen that were cooked up in the Big Bang but that somehow seemingly managed to disappear. This gas accounts for nearly half of the “normal” matter in the universe—the rest is locked up in galaxies. In an extensive search of the nearby universe, astronomers using STIS have definitively found this missing matter in the space between the galaxies. Called the intergalactic medium, this space extends from just outside our Milky Way galaxy to the most distant regions of space observed by astronomers. STIS observations of the local intergalactic medium showed that the missing hydrogen is still out there in very diffuse clouds in between the galaxies. This confirmation sheds new light on the large-scale structure of the universe and provides information on how galaxies built up over time. It also confirms fundamental models of how so much hydrogen was manufactured in the first few minutes of the universe’s birth in the Big Bang. A halo of very hot gas surrounds the Milky Way galaxy. Because the gas is so highly energized, or ionized, it is only visible in spectral features seen in ultraviolet wavelengths with an instrument like STIS. With its extremely high spectral resolution, STIS looks at the spectral features of the atoms in each of the many layers of gas to help scientists identify and understand the complexity of the halo structure. Besides the very hot gas that is trapped in the halo, some gas is falling into the Milky Way from the area between galaxies, known as the intergalactic medium. Other gas in the halo comes from star formation in the disk of the Milky Way. Supernovae and winds from stars can blow this material out of the plane of the Milky Way, up into the Galactic halo. This gas cools and gets denser, and some of it rains back down in what is often described as “the Galactic fountain.” STIS helps scientists understand these complex processes. The interstellar medium is everything between the stars. It’s typically very low-density material, which is extremely difficult to study. With its ultraviolet sensitivity and exceedingly high spectral resolution, STIS is a premier instrument for understanding this space. Scientists use stars or other bright sources as background light to view the intervening material. They “see” it indirectly through the absorption of the background light. The interstellar medium is not entirely uniform. There are places it is denser, places where it is less dense, and different clumps move at different velocities. STIS provides the fine velocity information to analyze the details of the interstellar medium. Using STIS, scientists can determine the physical conditions and separate out components from different densities and types of gas along the line of sight. Astronomers using STIS made the first direct chemical analysis of the atmosphere of a planet orbiting another star. 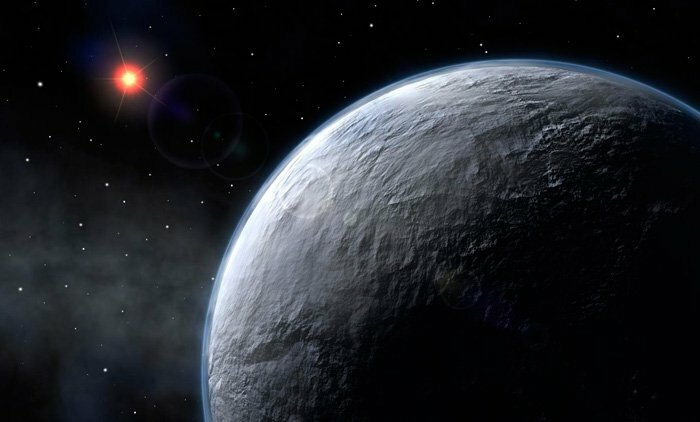 This opened up an exciting new phase of extrasolar planet exploration, where astronomers can compare and contrast the atmospheres of planets around other stars, and search for chemical biomarkers of life beyond Earth. The planet orbits a sun-like star called HD 209458. Its atmospheric composition was probed when the planet passed in front of its parent star, allowing astronomers for the first time ever to see light from the star filtered through the planet’s atmosphere. Scientists detected the presence of sodium in the planet’s atmosphere. They actually saw less sodium than predicted for the Jupiter-class planet, leading to one interpretation that high-altitude clouds in the alien atmosphere may have blocked some of the light. In 1984, Beta Pictoris was the first star discovered to host a bright disk of light-scattering circumstellar dust and debris. Ever since then, the 20-million-year-old star has been an object of intense scrutiny with Hubble and with ground-based telescopes. Astronomers used STIS in 1997 and 2012 to take the most detailed pictures to date of the large, edge-on, gas-and-dust disk. Astronomers found that the disk’s dust distribution had barely changed over 15 years, despite the fact that the entire structure is orbiting the star like a carousel. Identifying liquid water on other worlds is crucial in the search for habitable planets beyond Earth. STIS imaging shows suspected water plumes erupting from Jupiter’s icy moon Europa. Astronomers observed these finger-like projections while viewing Europa’s limb as the moon passed in front of Jupiter. Europa is a plausible place for life to have developed beyond Earth. If the venting plumes originate in a subsurface ocean, they could act as an elevator to bring deep-sea water above Europa’s surface, where visiting spacecraft could sample it, study its habitability, and even look for life. This offers a convenient way to access the chemistry of that ocean without drilling through miles of ice. STIS also revealed that another Jovian moon, Ganymede, may contain a subsurface ocean. STIS found evidence for it by watching aurorae glowing above the moon’s icy surface. The aurorae are tied to the moon’s magnetic field, which descends to the core of Ganymede. A saline ocean would influence the dynamics of the magnetic field as it interacts with Jupiter’s own immense magnetic field, which engulfs Ganymede. Because telescopes can’t look inside planets or moons, tracing the magnetic field through aurorae is a unique way to probe the interior of another world. R136 is a very massive and young dense star cluster in the Tarantula Nebula within the Large Magellanic Cloud, a neighboring galaxy to our Milky Way. Only Hubble can resolve the individual stars in the dense core, which is only a few light-years across and less than 2 million years old. Astronomers used STIS to obtain ultraviolet spectra of the individual hot luminous stars in the core and showed in 2016 that there are nine stars with masses over 100 times the mass of the sun. The detected stars are not only extremely massive, but also extremely bright. Together these nine stars outshine the sun by a factor of 30 million. This discovery has led astronomers to examine the 20 years’ worth of STIS observations available in the Mikulski Archive for Space Telescopes (MAST) for further examples of monster stars in more distant star clusters. Some have recently been found in the dwarf galaxy NGC 5253, and the search continues for more examples. The volatile, erupting pair of massive stars called Eta Carinae has long intrigued astronomers. In 2009, STIS analyzed the ejecta from an eruption seen in the late nineteenth century, resolving the chemical information along a narrow section close to the binary. The resulting spectrum showed iron and nickel that had been cast off in the nineteenth century. STIS also revealed the interior material being carried away by the ongoing, colliding winds from Eta Car A, the primary star, and those of Eta Car B, a hotter, less massive star. A very faint structure, seen in argon, is evidence of the interacting winds excited by ultraviolet radiation from Eta Car B. Eta Car A is one of the most massive and luminous stars visible in the night sky. Because of the star’s extremely high mass, it is unstable and uses its fuel very quickly, compared with other stars. Such massive stars also have short lifetimes, and astronomers expect that Eta Carinae will explode as a supernova within a hundred thousand years. Thirty years ago, astronomers witnessed one of the brightest stellar explosions seen from Earth in more than 400 years. The titanic supernova, called SN 1987A, blazed with the power of 100 million suns for several months following its discovery on February 23, 1987. Ten years later, STIS provided an unprecedented look at the light-year-wide ring of glowing gas surrounding SN 1987A. The long-slit spectrograph viewed the entire ring system, dissecting its light and producing a detailed image of the ring in each of its component colors that correspond to nitrogen, hydrogen, and sulfur. By dividing the ring into its component elements, astronomers put together a picture of how the ring was created. STIS measured the velocities of hundreds of gas knots streaming at hundreds of thousands of miles per hour from the nucleus of galaxy NGC 4151, thought to host a supermassive black hole. This was the first time the velocity structure in the heart of an active galaxy was mapped so precisely so close to its central black hole. This image was captured by the NASA/ESA Hubble Space Telescope’s Advanced Camera for Surveys (ACS), a highly efficient wide-field camera covering the optical and near-infrared parts of the spectrum. While this lovely image contains hundreds of distant stars and galaxies, one vital thing is missing — the object Hubble was actually studying at the time! This is not because the target has disappeared. The ACS actually uses two detectors: the first captures the object being studied — in this case an open star cluster known as NGC 299 — while the other detector images the patch of space just ‘beneath’ it. This is what can be seen here. Technically, this picture is merely a sidekick of the actual object of interest — but space is bursting with activity, and this field of bright celestial bodies offers plenty of interest on its own. It may initially seem to show just stars, but a closer look reveals many of these tiny objects to be galaxies. The spiral galaxies have arms curving out from a bright center. The fuzzier, less clearly shaped galaxies might be ellipticals. Some of these galaxies contain millions or even billions of stars, but are so distant that all of their starry residents are contained within just a small pinprick of light that appears to be the same size as a single star! The bright blue dots are very hot stars, sometimes distorted into crosses by the struts supporting Hubble’s secondary mirror. The redder dots are cooler stars, possibly in the red giant phase when a dying star cools and expands. Using ESO’s Very Large Telescope and other telescopes a fossilised remnant of the early Milky Way harbouring stars of hugely different ages has been revealed by an international team of astronomers. This stellar system resembles a globular cluster, but is like no other cluster known. It contains stars remarkably similar to the most ancient stars in the Milky Way and bridges the gap in understanding between our galaxy’s past and its present. Terzan 5, 19 000 light-years from Earth in the constellation of Sagittarius (the Archer) and in the direction of the galactic centre, has been classified as a globular cluster for the forty-odd years since its detection. 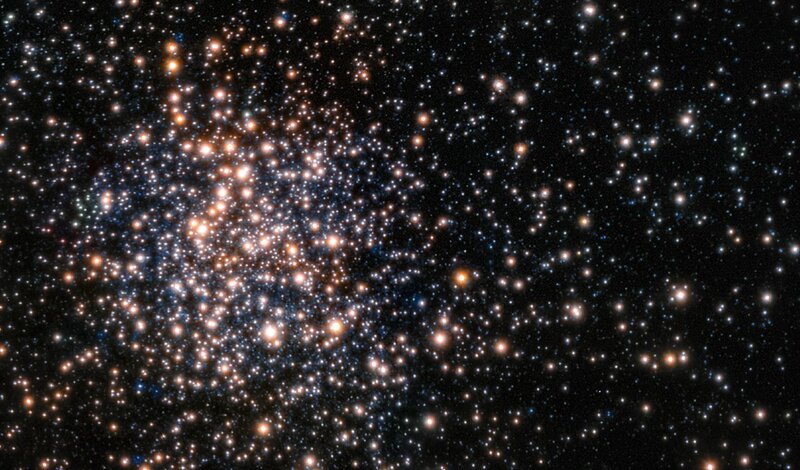 Now, an Italian-led team of astronomers have discovered that Terzan 5 is like no other globular cluster known. 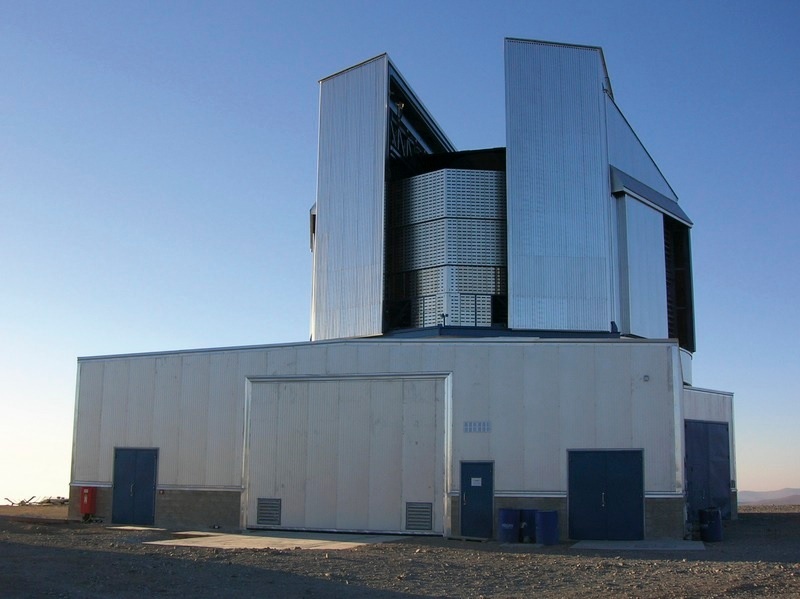 The team scoured data from the Multi-conjugate Adaptive Optics Demonstrator [MAD] , installed at the Very Large Telescope, as well as from a suite of other ground-based and space telescopes . They found compelling evidence that there are two distinct kinds of stars in Terzan 5 which not only differ in the elements they contain, but have an age-gap of roughly 7 billion years . The Multi-Conjugate Adaptive Optics Demonstrator (MAD) is a prototype multi-conjugate adaptive optics system which aims to demonstrate the feasibility of different MCAO reconstruction techniques in the framework of the E-ELT concept and the second generation VLT Instruments. The researchers also used data from the Advanced Camera for Surveys [ACS]and the Wide Field Camera 3 [WFC3] on board the NASA/ESA Hubble Space Telescope and NIRC2 (the Near-Infrared Camera, second generation) at the W. M. Keck Observatory. The team is composed of F. R. Ferraro (Dipartimento di Fisica e Astronomia, Università degli Studi di Bologna, Italy) , D. Massari (INAF – Osservatorio Astronomico di Bologna, Italy & Kapteyn Astronomical Institute, University of Groningen, Netherlands), E. Dalessandro (Dipartimento di Fisica e Astronomia, Università degli Studi di Bologna, Italy; INAF – Osservatorio Astronomico di Bologna, Italy) , B. Lanzoni (Dipartimento di Fisica e Astronomia, Università degli Studi di Bologna, Italy), L. Origlia (INAF – Osservatorio Astronomico di Bologna, Italy), R. M. Rich (Department of Physics and Astronomy, University of California, Los Angeles, USA) and A. Mucciarelli (Dipartimento di Fisica e Astronomia, Università degli Studi di Bologna, Italy). See the full ESO article here . See the full Hubble article here .